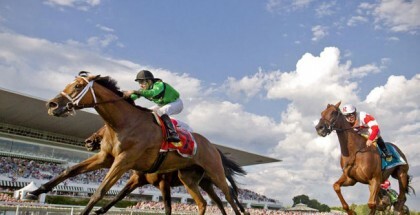 On Saturday, racing fans across the globe will be united in anticipation as all eyes turn to the weekend’s stakes races in preparation for the 2019 Kentucky Derby (G1). The winner of the coveted $1 million Toyota Blue Grass Stakes (G2), run at Keeneland Racecourse in Lexington, Kentucky, is promised 100 points towards the Derby and is all but guaranteed a shot at the world-famous race. Owners and trainers are also interested in second through fourth places, as they provide 40, 20, and 10 Derby points respectively. The beloved stone walls of Keeneland will be packed to the brim at the 6:23PM post time for the 10th race as we wait to see just who will be returning to Louisville for the first weekend in May. The Blue Grass is run as a part of Keeneland’s spring meet that usually boasts a combined attendance figure of over 250,000 people – in 2017, 32,610 people attended on Blue Grass Stakes day alone, so here’s hoping Keeneland has plenty of its sinfully good bread pudding and Kentucky burgoo on hand, and whatever bourbon-happy poltergeist that controls Kentucky’s weather decides to be merciful. 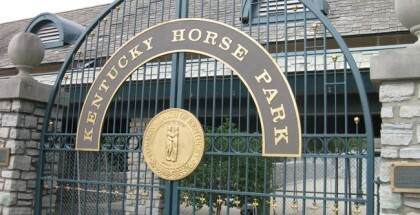 The Blue Grass has a history of producing Derby starters and winners and has seen many a talented horse cross the wire. The aptly named, wild-tempered colt Whirlaway ran second in the Blue Grass in 1941 before going on to become the nation’s fifth Triple Crown winner. In 1964, Northern Dancer — the bay Canadian icon and favorite — won the Blue Grass by a half-length and went on to win the Derby and Preakness and was later inducted in the Racing Hall of Fame in both Canada and the United States. Riva Ridge, the Derby and Belmont winner who was a famed stable mate of the legendary Secretariat, also won the Blue Grass in 1972. Some other famous Blue Grass winners include Hall of Famers Alydar, Spectacular Bid, Summer Squall, Prairie Bayou, Holy Bull and Skip Away. Street Sense, the 2007 Derby winner, was second in the Blue Grass and Thunder Gulch was fourth in the Blue Grass before taking home the roses in 1995 and the well-loved stallion became the “babysitter” in the pasture for 2015 Triple Crown winner, American Pharoah upon his retirement from stud duty. Last year, champion Good Magic — the red son of Curlin who became the first juvenile to break his maiden in the Breeders’ Cup — won the Blue Grass by 1 ½ lengths and went on to challenge eventual Triple Crown winner Justify in the mud and heavy rain in the both the Derby and Preakness, finishing second and fourth, respectively. If this Derby season’s previous races are any indication of a trend of winners, this year’s Toyota Blue Grass is shaping up to be anyone’s race. One may not be able to kill a Toyota, but it seems one can very quickly demolish expectations and wagers (Sorry. Sore subject?) with the Blue Grass results we’ve been seeing: bottom line is that the favorites aren’t winning lately. With that said, there are several popular contenders in this year’s field of 14, including Somelikeithotbrown and Vekoma, as well as Signalman and Win Win Win. Drawing the number 1 post for the Blue Grass was Somelikeithotbrown, who caught everyone’s attention with a win in the Jeff Ruby Steaks (GII) in early March. The victory gave trainer Mike Maker win number five for the race and also caused him to point the bay son of Big Brown to here in search of more Derby points to add to the 20 he earned last out. 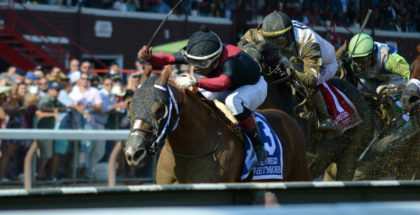 Somelikeithotbrown has won three of his seven starts and came in close second or third in three others. Despite winning his last two starts, however, the biggest question surrounding this horse is dirt simple: that is, can he make it on Keeneland’s dirt surface? Both of Somelikeithotbrown’s recent wins have been on the synthetic surface at Turfway and he has not raced on dirt since his debut race at Saratoga last July, in which he finished seventh. Co-owner Harvey Diamond has called the colt “agile” and has stated on multiple occasions he sees no reason he would not be strong on both surfaces, believing the first race on dirt was not an accurate representation of his horse’s abilities due to a sloppy track that day. The colt’s pedigree gives him some hope on the dirt, but we will have to wait until Saturday to see if Somelikeithotbrown’s performance in the Blue Grass will be as impressive and delicious as the famous Kentucky sandwich for which he is named. Switching surfaces certainly seems to be working well this season for trainer Mark Casse, however, who has two horses in the Blue Grass field and also has one of the Derby points leaders, War of Will, after switching him from turf to dirt. Currently in the Casse barn for the Blue Grass are Dream Maker and Sir Winston. 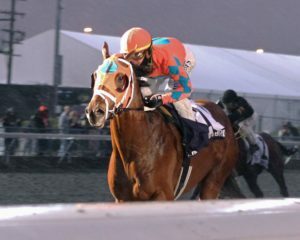 Dream Maker has quickly proven to be one of the most unpredictable horses in the field. He won his debut at Churchill Downs, only to come in fifth in his next race, 12th at Keeneland in the Breeders’ Futurity (G1), winning again in an optional claiming race at Fair Grounds, and then tenth in his most recent start in the Tampa Bay Derby (GII). The son of Tapit could be a contender if he is more consistent here, but only time will tell. Dream Maker will break from post position six with jockey Florent Geroux, and Casse opted to add blinkers for the Blue Grass. He is certainly an interesting one to watch to see if he will be a heart breaker or a Dream Maker. The second Casse runner, Sir Winston, has been a bit more consistent than his barn mate, but unfortunately has been consistently non-threatening, placing fifth and fourth in his most recent starts in the Tampa Bay Derby and Withers Stakes (GIII), respectively. However, the horse is a closer and there is some question over whether the Blue Grass – which is slightly longer than the races he’s been entered in previously — could be what he needs if the pace is good. Ridden by Julien Leparoux, the son of Awesome Again drew post nine and was assigned 15-1 morning line odds. The increasingly popular Vekoma is the early Blue Grass favorite, both on the morning line and in public perception. He has a bit of an odd running style, to put it lightly, but it seems to be working for him as he has won two of his three starts at Aqueduct and Belmont, and fought hard for a third in the Fountain of Youth Stakes (GII) at Gulfstream Park. 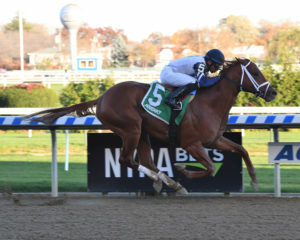 He also pulled out a strong 99 Beyer figure in his victory in the Nashua Stakes (GII) at Aqueduct in November. Replacing his previous jockey, Manuel Franco, is Hall of Famer Javier Castellano, who hopes to be aboard his first Blue Grass winner on Saturday. Should he win, however, the hard-working chestnut’s pedigree (and previously mentioned running style) may be working against him for distance in the Derby, given his damsire Speightstown was a known sprinter. Never one to miss the opportunity to run a horse in a Triple Crown race, trainer Todd Pletcher adds So Alive, a half brother to grade 1 winner and last year’s Wood Memorial Stakes (GII) winner Vino Rosso, to the field. Pletcher is currently tied for the most victories by a trainer in the Blue Grass, with win in 2005, 2008 and 2015. So Alive also seems to like Keeneland, as he broke his maiden in an impressive debut over the surface in October. The colt finished third to Well Defined and Kentucky Wildcat in his most recent start at Tampa Bay Downs in the Sam F. Davis (GIII) back in February. 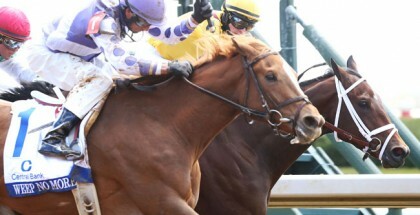 Also hoping to “win, win, win” at Keeneland this Saturday is Win Win Win. 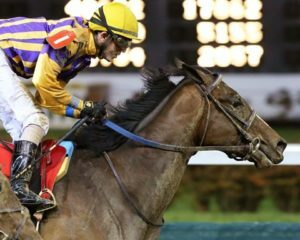 The Mike Trombetta-trained bay colt set a track record at Tampa Bay Downs in the Pasco Stakes back in January and has caught the attention of the betting world. He has also already beaten fellow Blue Grass competitors Dream Maker and Sir Winston, and has 10 points on the Derby board after finishing third in the Tampa Bay Derby last out. There is some concern over this recent placing, however, as the pace in the final stretch of that race was practically made for him, and many are wondering if this race’s distance will prove too much. Win Win Win will have another chance to prove himself with jockey Irad Ortiz, Jr. from post eight on Saturday. Signalman, both selected as a yearling and now trained by Ken McPeek, brings another interesting race record to this year’s Blue Grass. His most recent performance in the Fountain of Youth, in which he placed seventh, led many to dismiss the horse’s chances for the Derby. However, it was later revealed he had lost a shoe during the race. With McPeek calling him “gutsy and smart” and a very strong campaign in the fall, Signalman’s connections are thrilled with the horse and are hoping the Blue Grass will redeem his record as a 3-year-old. Market King may also be one to watch, depending on the pace. He has more starts than most of the horses in this race and given his recent performance in a tough race against Omaha Beach in the Rebel Stakes (GII), he could pull out a spot in the money if the pace is not blazing. His trainer, D. Wayne Lukas, said that he has “improved every race he’s run this spring” and has been very pleased with the Into Mischief colt’s performance. Every race has a wild card, and the one in this race happens to be Chess Chief. It would take a jockey as strategic as this horse’s name to pull out a win with him; the horse only just broke his maiden and has little in the way of stakes experience. However, his trainer, Dallas Stewart, has hopes for the horse, and may be saying “checkmate” to us all come race day. Lucky Lee, a Flatter colt trained by John Servis, brings strong speed figures though a weak record to this race, as he finished last in the seven-horse Withers field behind fellow Blue Grass competitors, Sir Winston and Admire. It remains to be seen if he can transform his strong Beyers to a win in a major Derby prep. If the long shot Parsimony wins the Blue Grass and gets into the Derby, the roar of the crowd at Keeneland would be able to be heard from another solar system. The Doug O’Neill-trained colt has yet to win a race, and placed eighth in the Rebel back in March. He has been beaten by others in this field, and has a lot to prove come Blue Grass Day, but stranger things have happened in Kentucky. Dale Romans brings two horses to the field — Admire and Moonster. Moonster, sitting at 30-1, is another horse who would cause a major uproar at Keeneland if he won. By Malibu Moon, he has a bit of an unattractive record leading up to this race despite a third-place finish in the Jeff Ruby Steaks. Admire, meanwhile, could prove interesting to handicappers thanks to his fifth-place finish in the Withers if he puts forth a strong effort. Rounding out the field is Aquadini, the 30-1 son of Bernardini and a big longshot to win this race. He has very little experience in races of this caliber with no stakes races on his record, and drew post 14, which does him no favors. Though he did break his maiden with a strong performance at Fair Grounds, it is difficult to predict how he will respond in this jump in class. Overall, this year’s Blue Grass holds a lot of intrigue. The phrase “anything can happen” is always true in racing, but there are so many unknown variables coming into this race, it really is going to be an interesting one to watch. Will this race break the recent streak of favorites not winning, or will an obscure horse cross the wire in a major plot twist?